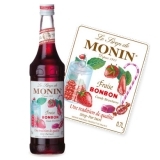 Monin Irish syrup in stylish 70cl glass bottle. The popularity of Irish Coffee spans the decades and geographic boundaries. 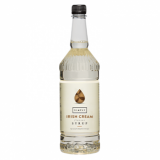 Inspired by this traditional Irish beverage, coffeehouses everywhere have not only adapted, but embraced Irish Cream flavoured beverages. Monin Irish is versatile and ideal for flavouring speciality coffee beverages or complementing smoothies, shakes and so much more. Colour: Brown with amber glints. Taste: Caramel and coffee smell with buttery notes, roasted coffee taste with touch of toffee. Applications: Coffees, flavoured milks, dessert drinks. Please note: Not compatible with tea. Sugar, water, flavouring, acidifying agent: citric acid, colouring agent: caramel E150d.